Iraqi Christians demand the reconstruction of the Mar Mattai and Mar Behnam monasteries in the Ninevah Plains. Fighters from Kataeb Babylon, a Christian group that fights alongside the Popular Mobilization Units, gather at the Mar Behnam Monastery after it was recaptured from the Islamic State, Ali Rash, southeast of Mosul, Nov. 21, 2016. BAGHDAD — A new era has started in the northern Ninevah Plains, known for its ethnic and religious diversity, following the expulsion of the Islamic State (IS). IS took over the area in June 2014 and forced the Christians living there — estimated at more than 100,000 — to abandon their farms and towns and head to the neighboring Kurdistan Region and other areas in the country, or to leave Iraq altogether. On May 16, the heads of the Christian churches told the media of their “concerns over the possible return of terrorism” and demanded that “the areas of the Ninevah Plains be protected by the United Nations and enjoy autonomy.” This fear, however, has not prevented many Christians from returning to their farms and cities and practicing religious rites in their monasteries and churches. During the Easter mass April 15 at the Mar Mattai Syriac Orthodox Monastery in Ninevah, Christians prayed for the safe return of the displaced to their homes and the spread of peace. IS reduced several monasteries and churches to ruins, and Christians in the Ninevah Plains are demanding that plans be made for their reconstruction, especially for the monastery of Mar Behnam. It dates to the fourth century; IS occupied it in 2014 and bombed it in 2015. They are also calling for the reconstruction of the Mar Mattai Monastery, founded more than 1,600 years ago. 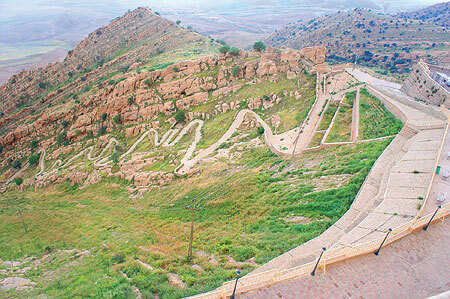 Yonadam Kanna, a Christian member of parliament, told Al-Monitor, “IS besieged the Mar Mattai Monastery in 2014 and prevented people from getting to it. So the first thing I did after the liberation of the Ninevah Plains was to restore the road leading to this monastery through the slopes of Mount Maklub, on top of which the monastery is built. [The monastery] extends over about 1 kilometer [0.6 miles] at a height of 2,400 meters [7,874 feet] above sea level." As for the role of the Christian Waqf Foundation, Media Director Hani Kasto told Al-Monitor, “The waqf formed committees to study the reconstruction projects of the Mar Mattai and Mar Behnam monasteries." So long as the extremist ideas planted by IS remain rooted in the behavior and beliefs of many people in the Ninevah Plains, the situation of the Christians in the area will be of concern, even amid tightened security measures. Before the reconstruction of the monasteries, churches and places of worship in the Ninevah Plains, cultural and intellectual rehabilitation is required, so that a culture of moderation, coexistence and tolerance can emerge.